that breaks ice on the Chicago River in the winter. 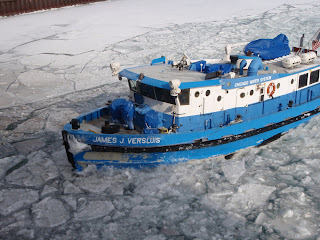 when it was starting its ice breaking work. I just happened to see the two ice breakers n the Antarctic breaking ice on television last night. They were huge ships and I guess have to be big to ram up on the ice and the sheer weight of the ship breaks the ice. this is a nice shot of this tug breaking ice on the river. Very interesting! I've never seen an ice breaker before. Oh, brrr. What a hard working tug. It almost looks like a toy in the midst of that icefield.